Anyone can have a yard sale, but not everybody has a successful one. Having stuff to sell is just half the battle; the other half is planning. With a little bit of preparation, you can make the most out of your yard sale and bequeath troves of treasure to your local community. Receipts – Get these at Staples or any office supply store. Hand sanitizer – Many adults and children will be touching your stuff. Everything You Own in a Box to the Left? How do you decide what to sell? You may be tempted to gather up all the junk you’ve accumulated, throw everything out of your front door and let customers do the rest. But you’ve got to think realistically about what others would want to buy and at what prices. Do your research. Research whether the items you want to sell are selling elsewhere, like at other yard sales or online, and the going rates. New or gently used items should be easier to sell than items or collectibles that have gone out of style. Use price calculators for used goods like WorthMonkey—which scours websites like eBay, Google and Amazon for pricing data—to help you price your items. Sell for the season. Is it summertime? Sell that old kiddie pool the kids have outgrown. Winter? Bring out the overcoats. Try to think about what items people need for the current season and sell those things. Think like a buyer. Would you buy the items you’re selling if you had a need for them? Avoid selling broken things or things with little market value. Be honest. If you’re going to sell things that are slightly broken, missing parts or don’t work as well as they used to, then be completely honest with buyers. Tell them up front what works and what doesn’t, and price accordingly. Don’t sell items with sentimental value. Selling a family heirloom might be a lucrative decision, but can you live with it? Don’t sell items that you might regret selling or that you’ll want back later. Advertising your yard sale in as many places as possible is the key to getting people to show up. Post around your ‘hood, in local places of business and online. Use eye candy to attract potential buyers. Get good signage. Your yard sale signs are the book covers to be judged by prospective readers. At the very least they should be legible for drivers-by, and ideally they should look professional and be sturdy. Before you use flimsy poster board and cheap markers, consider purchasing yard sale signs from your local home improvement store and/or printing flyers instead of writing them by hand. Find the right spots. Check on local signage laws to find out where you can legally advertise your yard sale. Put your signs in as many places as possible around the neighborhood. In addition to signs around your neighborhood, post flyers on bulletin boards of local businesses and community centers. Post online. 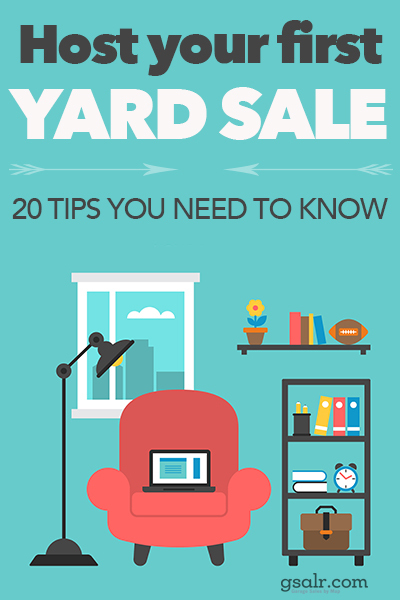 Post your yard sale on community sites like Gsalr.com and YardSales.net, as well as your Facebook, Twitter, Google+ and other social pages. Describe the items you’ll be selling or at least post a list of categories that may appeal to specific shoppers. Take photos. A picture’s worth a thousand words—and money in the bank. It goes without saying that attractive photos make the best advertising. Take photos of some of your best sale items and post them online to sites like Flickr and Tumblr. Link to these pictures on social media sites. Seek out bargain shoppers. Go where your potential customers are and advertise. College students love bargains, so advertise your yard sale at local schools. If you can, plan to have your sale around the student leasing cycle: students are usually gone for the summer and return in the fall. Conversely, older people might make better customers for antiques or higher end items. Having a yard sale is just like owning your own store for a day. Think about the types of things that entice you to buy, and replicate them. On the day of your yard sale, make sure that you’ve covered all your bases. Put your best stuff out front. Most retailers prominently display their freshest, newest products at the front of the store near the entrance. You can do the same. Put larger and more attractive sale items, like furniture or bikes, close to or even at the corner of your street to entice drivers and passersby. Get organized. Department stores are typically divided into different sections for clothes, furniture, electronics, etc. Nobody wants to see piles full of junk that they have to sort through painstakingly. Organize your stuff into sections to make it easier to for shoppers to browse. Create incentives to stay and shop. Many retailers use tricks to create a positive effect on people’s shopping experiences. Play upbeat or relaxing music through portable speakers to get your shoppers in a browsing mood. Also, consider giving out freebies like refreshments to people while they shop. Be helpful, not annoying. Talk to you customers, but don’t be that pushy salesperson you’ve encountered so many times. If people seem interested in an item, ask if you can help with anything. Don’t try to sell them on items they’re not looking at. More flair. Check the Recommended section above for more things that can give your yard sale a professional appearance. Things like bags, receipts, bins and dolly carts will create a better shopping experience for the people at your sale. Secure your valuables. Protect your home and your valuables while your yard sale is happening. Don’t allow people to enter your home during the yard sale unless necessary. If you are selling valuables, keep them in a locked box or case when not showing to an interested person. Enlist helpers. You may be spread thin if you’re running a yard sale all by yourself. Enlist the help of friends and family members to whom you can divvy up tasks, like keeping track of money/sold items, talking to interested people, and keeping an eye out for possible thefts. Take cash; give receipts. Don’t accept checks because they may bounce. Take cash only, and make sure you have change to give back for larger bills. It’s smart to have receipts on hand, especially for people who pay for items in advance that they will pick up later. Be prepared to haggle. You’re probably going to negotiate the price of some items. Know how low you’re willing to go before you set a price in stone. As the day goes on and items haven’t sold, you’ll probably be more flexible. Don’t forget to take down your signs. After your sale has ended, take down any signs you’ve posted around the neighborhood. You don’t want people mistakenly driving to your house after the sale and going away disappointed.